This hotel is situated at the heart of O Grove, in Spain. The hotel is situated close to the fishing port, just a few steps away from the sea and the cove. The hotel is located close to La Toja Island and La Lanzada Beach. The towns of Combarro and Cambados are situated just a short driving distance away. This family-friendly hotel is perfect for every type of traveller visiting the area. The tastefully-appointed guest rooms ooze character and charm. The hotel features a range of excellent facilities and services, ensuring a comfortable stay for every type of traveller. Guests can work out in the gym, relax and unwind in the hot tub, or indulge in a rejuvenating spa treatment. This hotel is set amidst the protected, natural area of O Grove, in Spain. The property is situated just 1 km away from the beach. Guests can explore the beauty and splendour of Galicia with ease. The centre of O Grove is located just 3 km away. Guests will find themselves within convenient driving distance of Vigo and Santiago de Compostela airports, as well as the cities. This hotel offers comfort, style and relaxation. The guest rooms offer modern amenities and a peaceful setting in which to unwind. The hotel offers visitors many facilities and services, to ensure the utmost in comfort and convenience. This upscale hotel boasts a peaceful setting, in the Galician region of Spain. The hotel is located just 6 km of O Grove. Guests will find themselves just 600 metres from the beach. A variety of shops and entertainment venues can be found just a short distance away. Vigo Airport is 60 km from the hotel. The wonderful city of Santiago de Compostela is 75 km away. This family-run hotel offers superbly-styled guest rooms, which come well equipped with modern amenities. Guests can enjoy a leisurely stroll through the hotel's gardens, or simply sit back and relax. The hotel features a superb restaurant, where delectable dishes are served. With a stay at Hotel Gavia in O Grove, you'll be next to a golf course, just a 1-minute walk from Ría de Arousa and 13 minutes by foot from Paseo Maritimo. This golf hotel is 1 mi (1.6 km) from Familia Mariscadora Monument and 1.1 mi (1.7 km) from Church of San Martino. This hotel is located in O Grove, within 5 minutes of the Isla de la Toja and the centre of O Grove. It is around 200 m to the nearest beach and an array of shops lie approximately 300 m from the hotel. A bus stop and a park are situated 600 m from the hotel. A total of 42 rooms are on offer at this family-run hotel, which underwent complete renovation in 2006. Facilities include disabled access, a playground, a lounge with a TV, a car park and a restaurant with a large dining room offering famed cuisine. 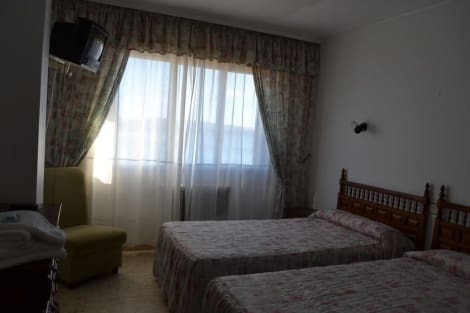 Each of the rooms comes with an en suite bathroom with a hairdryer, an Internet connection, a direct dial telephone, a minibar, satellite/ cable TV, background music, a double bed and central heating. The nearest golf course is approximately 600 m away. It is possible to book and bed and breakfast only stay. This hotel underwent renovation work in 2003 and comprises a 4-storey main building and annexe block offering a total of 60 rooms. Amongst the facilities count an inviting foyer with a 24-hour reception desk, lifts and a safe in addition to a caf, a bar and a restaurant with a terrace offering a range of culinary delights. There is also a conference room available for meetings and other events and the room and laundry services may be taken advantage of. Those arriving by car may take advantage of the hotel car park. Featuring modern and innovative facilities, this hotel offers the perfect place where to relax in style while staying away from home. Guests staying at this upscale establishment cannot miss some of the most important tourist attractions of this vibrant region, including La Toja island, San Martin and San Vicente churches, and O'Grove Aquarium. Nature lovers will be impressed by the crystal clear waters of the world-renowned Rias Baixas and will appreciate the quality of services of Sanxenxo beaches, located a short driving distance away. The bright and spacious rooms of this property feature a contemporary décor and range from standard to the luxurious suite, ideal for those most demanding travellers. The excellent spa area offers a range of professional treatments and this pet-friendly establishment also includes a cosy restaurant serving Galician nouvelle cuisine as well as the best regional wines. Take advantage of recreation opportunities such as bicycles to rent, or other amenities including complimentary wireless Internet access and concierge services. Additional features at this hotel include gift shops/newsstands and a television in a common area. This hotel is located in the tourist centre of O Grove and is about 500 metres from La Toja Island with its beaches. The establishment is also close to the sea promenade and the fishing port of O Grove. Restaurants, bars and pubs are close by, and shopping enthusiasts can head to La Toja, which offers various shopping venues. A bus stop 600 metres from the hotel provides access to the public transport network. This lively family-friendly hotel comprises a total of 30 fully equipped en-suite guestrooms featuring a balcony or terrace. All rooms are accessible through lifts. Guests can enjoy some quiet relaxation in the TV lounge or an invigorating walk around the garden. There is a swimming pool with sun loungers for those who wish to return from their vacation with a tan. Fans of the fairway can head to the nearest golf course, which is 2 km from the hotel. A few minutes from the beach¬A few minutes from towncentre¬Good location, easily accessable Free cribs subject to availability. Half board must be breakfast and dinner. lastminute.com has a fantastic range of hotels in O Grove, with everything from cheap hotels to luxurious five star accommodation available. We like to live up to our last minute name so remember you can book any one of our excellent O Grove hotels up until midnight and stay the same night.